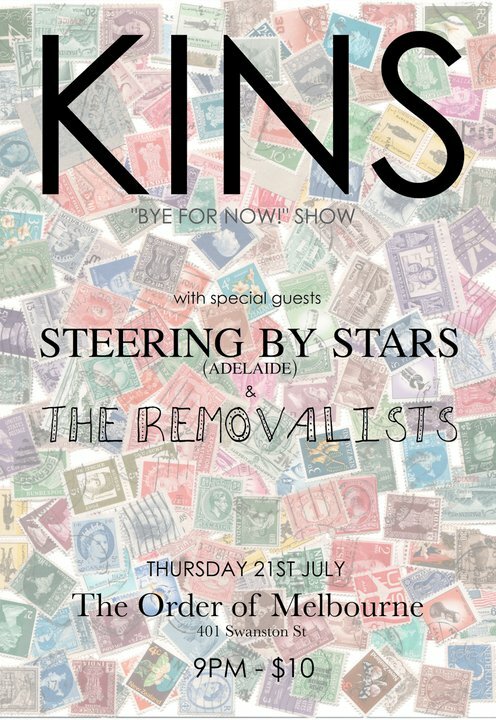 Melbourne’s Kins have announced that they will be relocating to the UK, however they’re bidding farewell to Australia with one final show at the Order Of Melbourne. The show is on the 21st of July and is a paltry $10, and also includes the excellent Steering By Stars (album review here), as well as The Removalists, who I’m yet to hear but will definitely check out. While it is a great pity to see them go, hopefully they move onto bigger and better things in the UK and make it back to Australia as soon as possible for some more shows. You can still grab their latest mini-LP, ‘Dancing Back In Forth, Covered In Whipper Cream’, from their Badcamp page, and you can RSVP to their farewell show via the Facebook event.